Samsung Galaxy S7 won't appear any time, soon, but we have some more information, about it. 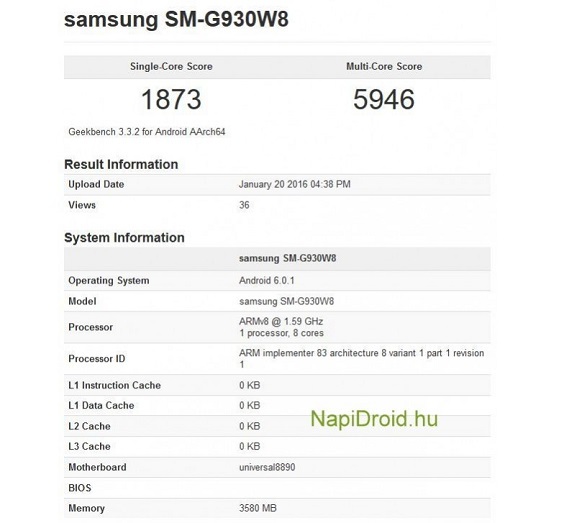 Thanks to a service called Geekbench, we have a chance to look at some of the hardware stuff that we will find inside. The device has a 5,1" main screen with a resolution of 2560 x 1440p, which is a great result. It packs a Snapdragon 820 unit, but we heard that a version with Exynos 8890 will be available as well. When it comes to the internal memory it will have 4GB of RAM memory and at least 64 GB of internatl memory to hold your files. The main camera unit is a 12 Mpx front snapper perfect for all pictures and videos that you will make. The result of Geekbench was very good for galaxy S7. It received a score of 1873 points for the single core test and 5946 in the multi core test. It is a lot better result than the previous model Galaxy S6 which received a score of 1300 - 1400 single core and 4200 - 5000 for the multicore. Samsung Galaxy S7 will be officialy presented in February at the convetion of MWC that places from 22 to 25th February. It will be available in a couple of variants like Galaxy S7, S7 edge and S7 edge plus.